Thank you so very much to Susanne for nominating me for the first time with the Sunshine Award. The response to this Blog has been overwhelming, especially as I have only been here for just a little over a month. It is inspiring to know just how many of you out there really do care about what is happening to threatened animals or wildlife. This has all brought Sunshine into my Word Press world. For that and your support, I want to thank you dear Susanne. – Nominate 5-10 other blogs and let them know they are nominated. 1.My grandmother had 18 children, which included three sets of twins, my mother was number 17! 3.I took Russian ballet lessons until I was 16 years old. 4.I majored in Anthropology, with minors in both Geology and Native Studies at CSUN. 5.I have traveled to many Native Reservations all over America, including the one closet to my heart, Pine Ridge in South Dakota. 6.My favorite place to be on Earth is standing in front of the Tetons just outside of Jackson Hole, Wyoming. 7.My favorite City in America is New Orleans, I could eat my way through every place in the French Quarter. Here are the Blogs that I would like to nominate for a Sunshine Blogger Award. From my heart to yours, you are most welcome. 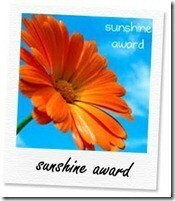 I’ve just nominated your blog a for a Sunshine Award! I didn’t realise you already had one, well done! To accept it and pass-it on to others click on the link for the (fun) rules. You are so very kind to do this. I have been given this Award twice and feel it would be quite greedy to do it again, so please do give it to someone even more deserving than I.
That’s a really lovely thing to do. The other lady I will award it to is having a ‘make do and mend year’ where she buys nothing new for her family but learns with them, how to upcycle things, sow, and the best places to buy second hand things etc. Basically because we are filling the planet with too much unnecessary waste. She had button jars and saved and reused everything. I learned so much from her and miss her every single day. She was unlink anyone else I have ever known.